The ringneck snake is a species of slender, mildly poisonous snakes commonly found in southeastern Canada, central Mexico, and many parts of the US. Their small stature, nonaggressive nature, and rear-facing fangs do not pose much threat to the humans. Females are comparatively larger while having shorter tails than the males. 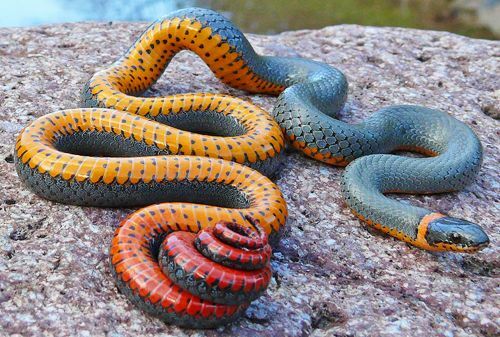 Ring-necked snakes are secretive reptiles that do not usually expose themselves to the daylight. 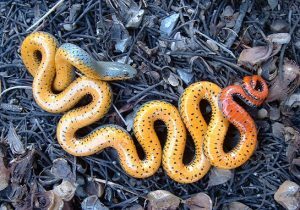 Diurnal activity is sometimes observed, particularly on cloudy days when they lie exposed to the sun to gain heat. They exhibit social structure with some populations existing as colonies of more than 100 individuals. 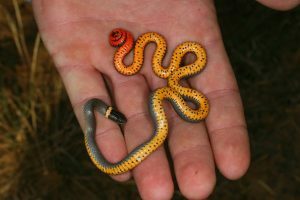 Some snake communities are often found occupying a single microhabitat. When in danger, ring-necked snakes with orange-red posterior raise their coiled tails toward the predators to warn them of their toxicity. 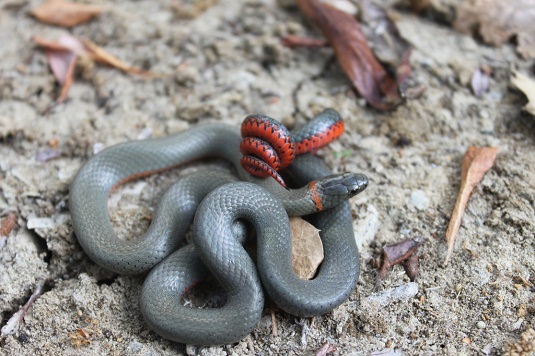 During the mating season, female snakes release pheromones from the skin to attract males. 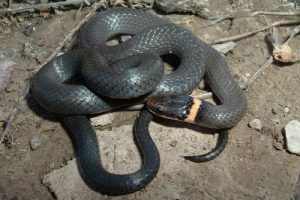 Once attracted, the male rubs his mouth along the body of the female snake, bites her around the neck ring and aligns his body with the female’s to release the sperm. In some subspecies, delayed fertilization may occur, with the eggs being laid during June-July in moist, aerated regions. 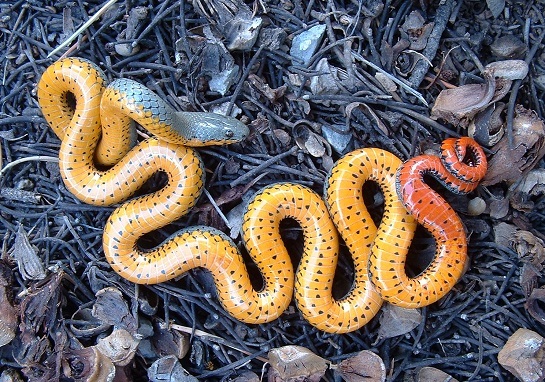 After the eggs are laid, there is no parental involvement in caring for the eggs. 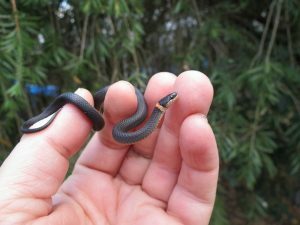 The young snakes are somewhat mobile and mature from the moment they hatch. 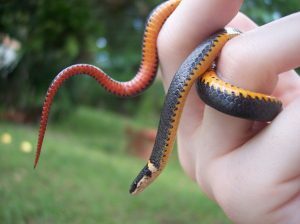 They reach sexual maturity at 3 years of age. 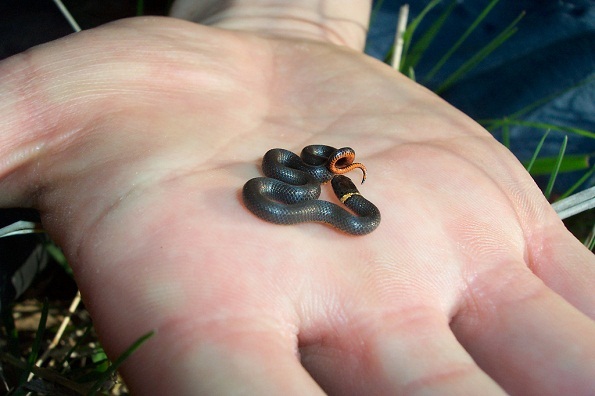 To secure its prey, the ringneck snake compresses and then injects venom into the victim’s body. 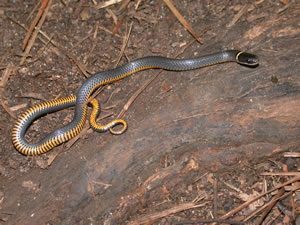 Instead of having true venom glands, the ringneck snakes possess the Duvernoy’s gland that might help in swallowing or digestion. 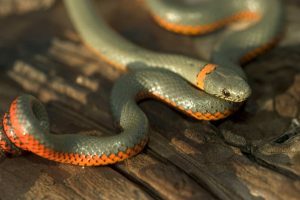 Published on December 7th 2016 by admin under Coniferous Forest Animals. Article was last reviewed on 7th December 2016.